The Arkay Fiberglass Rack Cleaning Sinks have a varity of uses for rack maintenance. The sinks are made using the most advanced high tech materials and fabrication techniques in their construction to insure integrity and the longest possible life. These sinks are made to exact specifications, each molded, reinforced composite sink is coated with a high gloss isophthalic neopetyglycol gel to insure years of maintenance free use. The 1/8" structural laminate has rounded corners, inside and out, this eliminates dirt traps making cleaning easy. The sinks have a light gray surface, and are molded with duckboard bottoms and large 1-1/2" drains. 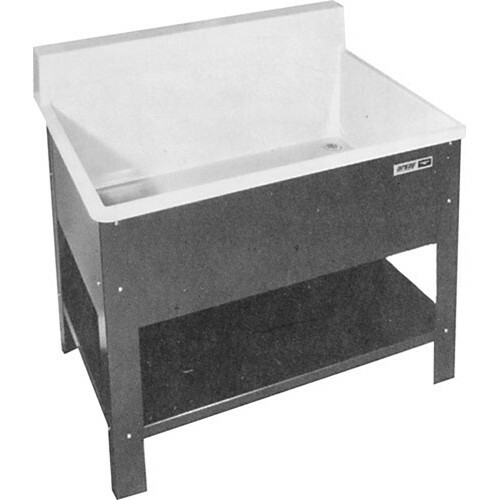 Fiberglass "Deep Sink" designed for processor rack maintenance and a variety of other uses. Full 30"(F-B) x 48"(L-R) x 14" deep I.D. smooth bottom sink pan. 7" high by 5' wide integral backsplash that will accept a factory installed water temperature control plumbing package or faucets of your choice. Light gray sink basin with contrasting charcoal gray clad 38" high steel stand and storage shelf included. Includes a hot/cold swing faucet with hand spray and a PVC sink mat to cover the entire inside of the sink bottom for protection to the sink and rack. How much is this sink?